As part of the Darlington Upgrade Project, the intersection of Ayliffes Road, Main South Road and Shepherds Hill Road will be partially closed from 8pm, Friday, 7 September until 6am, Monday, 10 September. 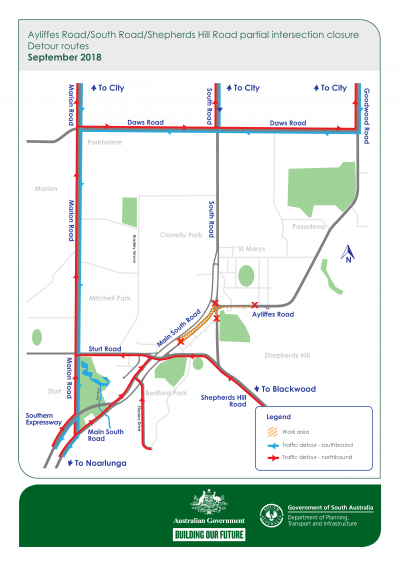 This closure will allow for the installation of the northern section of the bridge and will carry northbound traffic from Main South Road onto Ayliffes Road. The northern section of the bridge has been constructed off-site using the same method as the Main South Road bridges over the Southern Expressway. The southern section of this bridge will be constructed using traditional processes where the structure is built on-site in position from the ground up. Traffic will be reduced to one lane in each direction between Sturt Road and Tobruk Avenue. Ayliffes Road will be closed to traffic between intersection of Main South Road and Norman Street, St Marys. A single eastbound lane will be maintained to provide access to businesses on the northern side of Ayliffes Road. Motorists will not be able to enter Shepherds Hill Road from Ayliffes Road, South Road or Main South Road. Motorists are encouraged to use the Marion Road entry/exit to the Southern Expressway rather than the Main South Road entry/exit during this time.